Earning via the traditional method (actually staying in hotels) is just one way to accumulate points toward your next free night. Fortunately, hotels make it relatively easy to accrue points without traveling, whether through top credit card offers or by utilizing shopping portals and dining reward programs. You can also purchase points directly from the hotel. This week, Hyatt launched an excellent new buy points promotion. Now through October 25, you’ll get a 30-40% bonus when buying Hyatt points. Buy 5,000-9,000 points to get the 30% bonus level. If you buy at least 10,000 points, you’ll get 40% bonus points — bringing the price down to just 1.7 cents per Hyatt point. For the next three weeks, you can purchase Hyatt points for just 1.7 cents each. Enter your Hyatt Gold Passport number, name and email address. Select the number of points you want to purchase, enter your credit card information and billing address, agree to the terms and conditions and click Pay Now. Any purchased points will not count toward qualification for any increased or improved status or elite membership in the Hyatt Gold Passport program. The purchase is processed by Points.com, so you won’t get any travel category bonuses from this purchase. Make sure to make the purchase with the best non-bonus category credit card for your situation. Based on TPG’s point and mile valuations, the Chase Freedom Unlimited‘s 1.5x Ultimate Reward points would be the most rewarding choice. 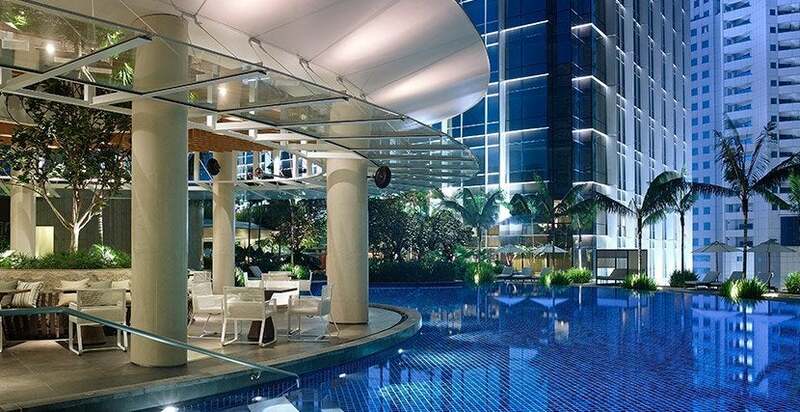 Snag the Grand Hyatt in Kuala Lumpur for ~$205 per night. Image courtesy of Grand Hyatt Kuala Lumpur. In his latest points & miles valuations, TPG values Hyatt points at 1.8 cents per point. When you buy at least 10,000 points through this promotion, you’ll be effectively buying points at 1.7 cents each. So, this promotion is certainly one to consider. However, whether or not it makes sense for your situation depends on your use of the points. For top-category hotels — such as the Category 6-7 hotels The Points Guy stayed at in Tokyo — you’re likely going to get better than 1.8 cents of value. Another way of getting excellent value is through a Points + Cash redemption. TPG Contributor Eric Rosen recently booked a Points + Cash booking netting an incredible 7.4 cents per point in value. If it’s free Hyatt nights you’re looking for, the Hyatt Credit Card is offering two free nights as a sign-up bonus after you spend $2,000 in the first three months. For a longer stay, combine the credit card sign-up bonus with this buy-points promotion to get four nights at a Category 6 hotel — such as the Grand Hyatt Tokyo or Park Hyatt Maldives — for just $855 out-of-pocket. Remember that you can also get Hyatt points by transferring points from Chase Ultimate Rewards. If you want another 100,000 potential Hyatt points, the Chase Sapphire Reserve is offering a 100,000 Ultimate Reward point sign-up bonus after spending $4,000 in the first three months. You can also earn and transfer points to Hyatt with cards like Chase Sapphire Preferred and Chase Ink Plus. Featured image courtesy of Park Hyatt Maldives. What’s your favorite use of Hyatt points?